Cucharas served with hot rice and homemade dill pickle. 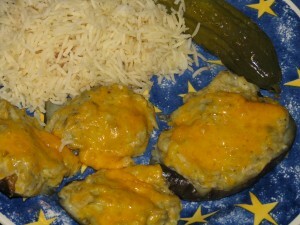 Cucharas is one of my favorite eggplant dishes. 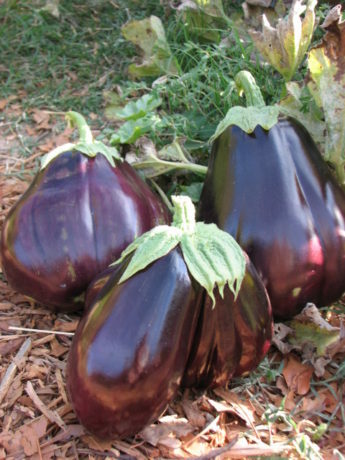 With several huge Black Beauty eggplants ready to eat, it is time to make these treats. There are several steps, but none of them difficult. The eggplant doesn’t need to be salted or oiled, and the result is tasty hot or as leftovers. 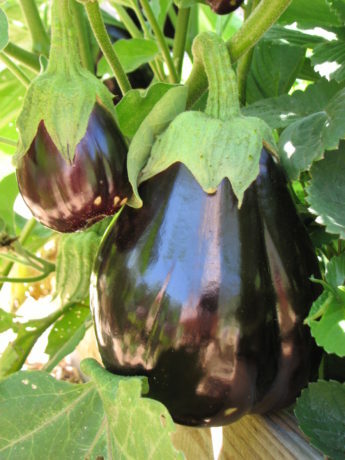 It doesn’t taste particularly eggplanty, so for those who don’t think they like eggplant, they may want to try this recipe. Halve, then quarter the eggplant. The word ‘cuchara’ in Spanish means spoon or scoop. 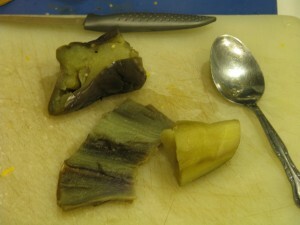 The eggplant ‘flesh’ is cooked then gently stripped away from the skins, which are reserved. 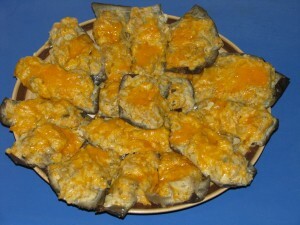 The insides are then mashed with yummy ingredients and then plopped back on the skins, then baked. The process is very forgiving, so if the skins tear, it is okay. It all sticks together with filling in the end. Scoop out the ‘flesh’ from the cooled skin, and save the skins. 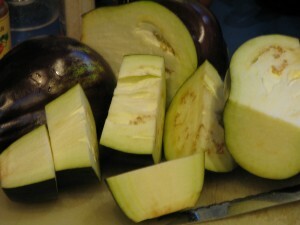 If you are using larger eggplants, then when filling the skin, just cut them in half. The cucharas should be either small enough to be picked up and eaten out of hand, or eaten with a fork. Cucharas make great finger – food as an appetizer. The original recipe is from Sundays at Moosewood Cookbook. Stem the eggplants and cut each in half lengthwise. Cut each half crosswise into four pieces. In a covered suacepan, simmer the eggplant chunks in water to cover for 15 minutes until pulp is tender. Drain the eggplant in a colander and set them aside to cool. Whjen you can comfortably handle the eggplant, use a teaspoon to separate the pulp from the skins, taking care not to tear the rectangles of skin. Reserve the skins. Should any tear apart, save them anyway because you can overlap two torn pieced to form a single iece and the filling will hold them together. In a bowl, vigorously mash the eggplant pulp with the garlic, or use a food processor or blender. Mix in the remaining ingredients, except for ½ cup cheddar cheese and nutmeg, and combine thoroughly. Add more matzo meal if the mixture seems too thin. Place a skin, shiny side down, in the palm of your hand. Mound it with the eggplant mixture about an inch thick. Place it on a well-oiled baking sheet. Continue until all the skins and mixture are used. Sprinkle a little of the reserved cheddar and a bit of nutmeg onto each couchara. Bake 350 degrees F for 20 minutes or until golden brown on top. The preparation can be done ahead of time and the coucharas baked just before serving.